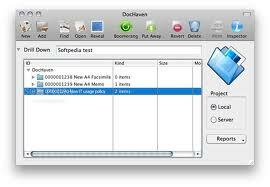 DocHaven for Windows is a cloud-based library for your documents. You run DocHaven as an alternative to the normal folders on your PC or file server. Your documents are permanently backed up. You take them out of the cloud as you need them then put them back into the cloud when you have finished with them. You can store any kind of document in these 'Projects'. Once a Project is back in the cloud it can be taken out by others in your group. DocHaven is a cloud-based library for your documents. But DocHaven for Windows is more than this - every time a Project is put away, it keeps the last ten versions automatically. So not only do you have the latest version, but if you make a mistake with your Project file, you can always go back to a previous version on the Cloud. Your files are in three places 1. your DocHaven folder 2. the cloud and 3. your cloud backup. At least three copies, at least two different media and at least one of the copies is offsite. Plus DocHaven also gives you extra assurance with multiple versions on the cloud and in your backups. DocHaven for Windows, like the other HMS Cloud products, runs on Macintosh, Windows and Linux, so you can share your documents with any other users world-wide. Qweas is providing links to DocHaven for Windows 4.6 as a courtesy, and makes no representations regarding DocHaven for Windows or any other applications or any information related thereto. Any questions, complaints or claims regarding this application DocHaven for Windows 4.6 must be directed to the appropriate software vendor. You may click the publisher link of DocHaven for Windows on the top of this page to get more details about the vendor.